Exhibitions, showcases and talks are organized all over the city of Copenhagen bringing together the most significant players in the Danish industry and creating an exciting and welcoming platform for professionals to meet. During 3 Days of design 2017, the Embassy of Switzerland opened its doors for exclusive insights in Swiss design with its Design Picnic, including companies, designers and Design Universities showcases as well as talks and a fashion show. In addition to the exhibition at Hawaii Bio, the invited labels were present at the Embassy for a series of talks in the garden. The presentations and interviews were streamed live by LIVINGROOM.FM. 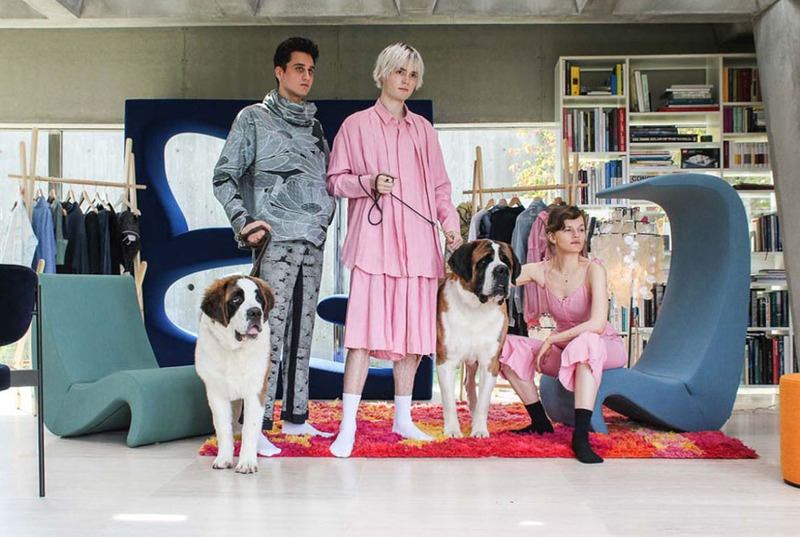 Pro Helvetia is delighted to invite a selection of young designers to take part to this event through the organization of an exhibition in a downtown venue, an surprising fashion show as well as a series of talks at the embassy. Showing their work in this context gives the designers the opportunity to meet with relevant design-related people and possibly develop further business collaborations in Denmark. BIG-GAME‘s work is described as simple, functional and optimistic. They produce a variety of products and accessories for companies such as Alessi, Hay, Karimoku, Muji, Magis, Nespresso and Moustache and have received numerous awards including the Swiss Design Award and Wallpaper Design Award. EGLI STUDIO is a Swiss based industrial design studio composed of Thibault Dussex and Yann Mathys, both graduated from ECAL in 2013. Their interest for materials and processing technologies is translated in their simple and rational design. Their work has been awarded by a Swiss Design Award and the Ikea Foundation Grant. JULIAN ZIGERLI designs highly technical fashion that is easy to wear, modern but still timeless and functional. The label is famous for the print collaborations with artists from all different areas. The effortless work collaborations between art and fashion is unique in its from and provides the pieces with a full doses of magic. To date, Julian Zigerli has presented his collections around the globe – with shows in Paris, Berlin, London, Milan, New York, Beijing and Seoul. VANESSA LORENZO (HYBRIDOA) is a hybrid explorer based in Lausanne. She designs electronic and biological systems, interfaces and researches the potential contribution of hybrid ecologies to enable new realities to exist, leading to new perceptions of our environment. SOL SOL ITO is specialized in exclusive small series and continues the tradition of premium Swiss understatement: unsurpassed craftmanship, exquisite high-gloss acetate, exchangeable spring-steel arms available in various colours and patented joints designed to optimally fit all nose bridges. SOL SOL ITO is created by industrial designer Sandra Kaufmann and artist Monika Fink. WORN is a Geneva-based accessory brand, launched in 2015, by fashion designer Madgalena Brozda and accessories designer Pauline Famy. WORN offers a range of unique leather bags with a strong creative identity and recognizable style. To ensure an outstanding quality of the handmade collections, WORN produces in small lines. Each piece is listed and numbered, the leather goods are made with highest quality italian leather. QWSTION offers sustainable everyday essentials. Their bags and products are developed in Zürich in their own prototyping workshop. This allows them to test new ideas and unique constructions in a very early stage of the product development, resulting in more refined products.